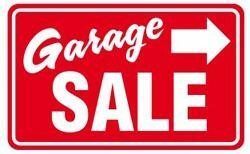 Our Tucker Hill residents invite you to one more community-wide, Fall Garage Sale for this year. This sale is set for Saturday, October 20, 2018, from 7 a.m. to Noon. Bargain hunters — look for sales staged throughout the community, hosted in the garages, driveways, or yards of participating residents. We anticipate well over 20 homeowners to participate. Below, please see a map with the exact addresses of those participating. Upon arriving in Tucker Hill, please also look for directional signage to help identify each sale location. All sales will begin at 7 am and will close at noon. Please, no early birds! To find Tucker Hill, please refer to the larger, more comprehensive Google Map found here. We are conveniently located off Highway 380/University Drive in McKinney, about 5 minutes drive from either the Dallas North Tollway or Central Expressway/Highway 75. In the event of inclement weather, please refer to back to this page for any changes in plans.